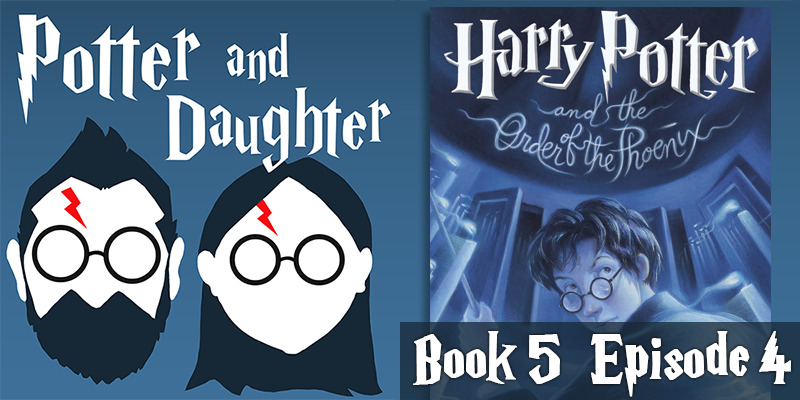 In episode twenty of Potter And Daughter Joel and Lily discuss Harry Potter And The Order Of The Phoenix chapters 20-26. Hagrid gets back from his secret mission and, from the looks of him, things didn’t go as well as he’d hoped. Umbridge sets her “evaluating eye” squarely on Hagrid as Harry shares a moment with Cho. Mr. Weasley is hospitalized after a brutal attack and the kids spend a the holidays at St. Mungo’s. Snape begins training Harry on how to protect his mind, and Hermione concocts a plan to get Harry’s story out to the Wizarding world.